Some of Promise’s new pyjamas and nightwear are among the most sweet, cute and feminine we have ever seen, and this is one of those designs. 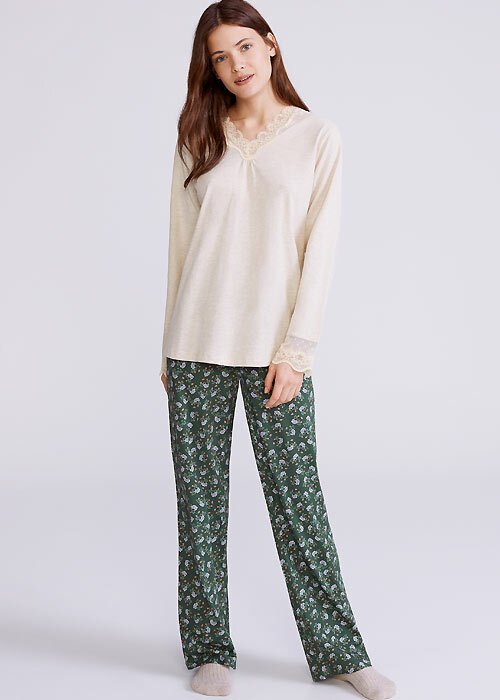 This long sleeve top and long pants set is one of the most gentle and restful looking items of nightwear in our collection right now. The oatmeal marl top has a little lace trim about its neck and the wrists and this adds a little more of a delicate and refined look to the item, but overall it is very quaint and easy on the eye. 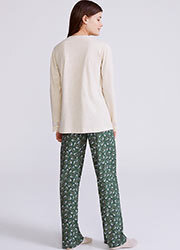 The pants that come with the item are just as cute and quaint thanks to the little floral motifs that litter the verdant green material. Also, Promise has perhaps the nicest packaging in the world of lingerie we have ever seen.